I'm a guy, why do I like this so much? Love live is a pretty well done, all the way around. It has interesting and well rounded characters, a good plot and it has well done humor. The anime is basically about never giving up hope, even when all odds are against you and pushing to be the best. Basically it's a "Rocky" (The Movie - Rocky) story, every episode, which isn't necessarily a bad thing, it's uplifting and entertaining to watch. The music is also catchy and pretty well executed, the singing is good and the instrumental/electronic background music has excellent depth and fits the mood greatly. The main target audience, for this show, appears to be teenage girls. It has a more universal, character driven, humor, that men and women would find appealing, so it may be ambiguous, as far as target audience is concerned. Whether you're a guy or girl, I would give this show a watch. It's funny, well written and above all, entertaining. If you haven't already, check this show out because it's a great one. I give it 5 stars out of 5. I really love this Anime and it was my first school idol Anime. Otonokizaka High School stands on the border of three cities: Akihabara—a pop culture mecca that's evolving by the minute; Kanda—a conservative, cultured city where history and tradition reign supreme; and Jinbo—a quiet area reserved for a more mature, sophisticated population. Amidst this culture clash, the school now faces closure due to the enrollment of fewer and fewer students. With the school planning to close within three years, nine female students come together with one thing in mind—form a pop idol group to revive the school's popularity and keep it from shutting down. "In order to protect our beloved school, there's only one thing we can do... become pop stars!" "All we can ask for is just a tiny bit of support from you. We truly believe that with your help, we can change the world around us. We will make our dreams come true!" 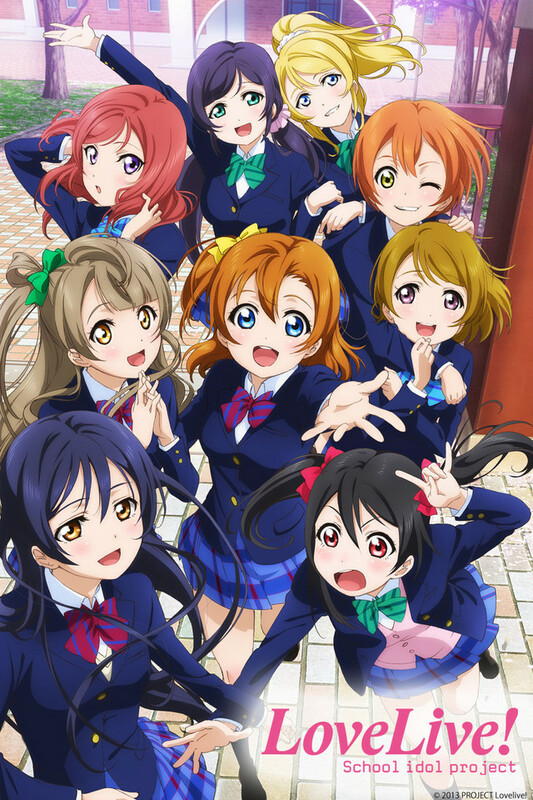 This Anime has 2 Season with the same characters but they go to Love Live this time. μ's Win Love Live! in Season 2 :D!!!!!! I really just really love this Anime and this is like K-ON! because when the Senpai Graduate (K-ON) Yui, Mio, Ritsu ,and Mugi, and (Love Live!) Nico, Eli, Nozomi. This Anime does have some scenes that will make you need like 100 tissues and boxes. I really love this I Highly Recommend this. Do not listen to those 1 and 2 stars. It's good to think to yourself "I'm glad I'm alive!" Especially for this moment. Curiosity has it's charms and this was definitely the time that it hit me. As a guy, at first I looked upon the anime cover and a little on the synopsis and I thought this would be another cliche like girl story about their school drama and stuff. But apparently that wasn't the case. Considering that I was somewhat desperate to find and anime to watch, I took the initiative of finding out what this anime was really about. 1st episode of the 1st season, WAPOW!!! The story started off quite smoothly. Not too long and not too short, just at the right pace. I was immediately in awe and couldn't stop watching this series. From 1st season to 2nd season it just never gets old. The atmosphere of hope, enthusiasm, friendship, love, and also sadness really touched me and I enjoyed it all the way through. Not only that, the art work was also to be praised. It was very cute and yet beautiful at the same time. The original soundtracks also was very well composed and integrated into the anime. Such beautiful sound could not be ignored, including the songs of the idols. Their songs had real meaning and also good dance moves that were incorporated to it. And finally, with a great anime comes with a great story and great characters. 9 girls, all with different personalities that fuse well together, formed a perfect group of dedicated school idols hoping to save their school from oblivion and at the same time achieving their own endeavors as popular school idols. If anything I give this 5 STARS out of 5! If you're looking for an anime full of all good things that teach a life lesson, and want to be ensnared to a great story full of great characters that can dance and sing with beautiful art work and amazing music, this is your best bet. So I'm a guy, and I teared up like 8 times. So I'm a guy, and I teared up like 8 times. That's the best way to introduce this review. If you like happy go lucky stuff, then this is for you. It's really lighthearted and positive, although it has it's drama and the consequences do feel real. This anime even has symbolism, as hard as that is to believe, it's there! You can feel the anxiety of the characters, and truly see how they develop. The humor is also rich, in my opinion! I've grown so close to the cast and their quirks that at the end of the second season I was legit holding back tears and thinking "Look how far they've come!" I had to punch a wall again to feel manly, and that only made me cry more! I'm biased as can be in this, so I give it 5 stars. Take that as you will, but this is a really good anime. Oh, and also *cough* *cough* Honoka best girl, fite mee . i am so grateful and glad i found this anime! this is what i was looking for! 3D anime dancing seems strange but it is awesome to me. a new anime in 2013. just what i need! :D Go Love Live!! Very good show and can't wait for the next episode! I really like Love Live! School Idol Project and all of its characters. The animation is good, and definitely expresses the girls' cuteness! The design of the characters tell a lot about their personalities. My most favorite character would be Kotori and Maki. So let me just give two words to each character that describes them. Honoka: determined and cute, Kotori: daydreamer and kind, Maki: distant and talented, Umi: logical and fit, Niko: cute and vain, Nozomi: wise and perverted, Eri: a leader and stubborn, Rin: sporty and energetic, and (the name I always forget) Hanayo: shy and quiet. I got them all, I think. Well, I like the music so far, but, to me, none of them have surpassed the music video songs. At least, hopefully, not yet. But I do love the opening song (Bokura wa Ima no Naka de) and the recent song No Brand Girls. Unfortunately, A-Rise's (a different school idol group in the anime) "Private Wars" has been the best idol song in the anime so far. I hope that by episode 13 μ's will have a really good song (but I have a pretty good feeling that episode 13 is going to be a cliffhanger, which means we'll have to wait for a few months before season 2 comes out). All-in-all, I really enjoy this anime, and always look forward on Tuesdays to watch it after I come home from school. The only thing that it needs is guys and romance!! I've watched and enjoyed tons of musical and idol anime in the past, but Love Live tops them all with its perfect combination of cuteness, superb animation and chara design, extremely emotional scenes, excellent music and hilarious comedy. I won't write a full, in-depth review this time because this anime is so popular that I'm quite sure someone else already did it better than I would, but I felt the need to at least write this recommendation. If you love cute girls doing cute things, music and idols you HAVE to watch this! I also happen to love the drawing style they used for this, ust like the title says it's quite cute!